...it's always tea-time...: A CHRISTMAS DREAM, AND HOW IT CAME TRUE. "Suppose we don't give you any presents at all,—how would that suit you?" asked mamma, anxious to please her spoiled child. "Come, now, and toast your feet," said Effie's nurse, "while I do your pretty hair and tell stories." "I'll have a fairy tale to-night, a very interesting one," commanded Effie, as she put on her blue silk wrapper and little fur-lined slippers to sit before the fire and have her long curls brushed. "I wanted to be a beggar-girl, and now I am one; but I don't like it, and wish somebody would come and take care of me. I don't know who I am, and I think I must be lost," thought Effie, with the curious interest one takes in one's self in dreams. But the more she thought about it, the more bewildered she felt. Faster fell the snow, colder blew the wind, darker grew the night; and poor Effie made up her mind that she was quite forgotten and left to freeze alone. The tears were chilled on her cheeks, her feet felt like icicles, and her heart died within her, so hungry, frightened, and forlorn was she. Laying her head on her knees, she gave herself up for lost, and sat there with the great flakes fast turning her to a little white mound, when suddenly the sound of music reached her, and starting up, she looked and listened with all her eyes and ears. "No; I am a Christmas spirit, and live with my mates in a pleasant place, getting ready for our holiday, when we are let out to roam about the world, helping make this a happy time for all who will let us in. Will you come and see how we work?" "I will go anywhere with you. Don't leave me again," cried Effie, gladly. With a wave of his candle all three miracles were wrought,—for the snow- flakes turned to a white fur cloak and hood on Effie's head and shoulders, a bowl of hot soup came sailing to her lips, and vanished when she had eagerly drunk the last drop; and suddenly the dismal field changed to a new world so full of wonders that all her troubles were forgotten in a minute. Bells were ringing so merrily that it was hard to keep from dancing. Green garlands hung on the walls, and every tree was a Christmas tree full of toys, and blazing with candles that never went out. In one place many little spirits sewed like mad on warm clothes, turning off work faster than any sewing-machine ever invented, and great piles were made ready to be sent to poor people. Other busy creatures packed money into purses, and wrote checks which they sent flying away on the wind,—a lovely kind of snow-storm to fall into a world below full of poverty. Older and graver spirits were looking over piles of little books, in which the records of the past year were kept, telling how different people had spent it, and what sort of gifts they deserved. Some got peace, some disappointment, some remorse and sorrow, some great joy and hope. The rich had generous thoughts sent them; the poor, gratitude and contentment. Children had more love and duty to parents; and parents renewed patience, wisdom, and satisfaction for and in their children. No one was forgotten. 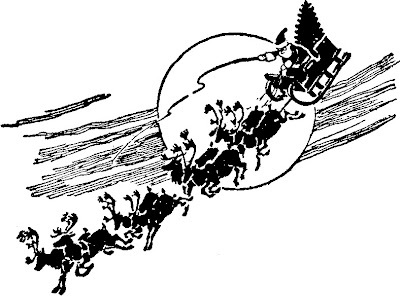 As he spoke the spirit pointed to four gates, out of which four great sleighs were just driving, laden with toys, while a jolly old Santa Claus sat in the middle of each, drawing on his mittens and tucking up his wraps for a long cold drive. "Why, I thought there was only one Santa Claus, and even he was a humbug," cried Effie, astonished at the sight. "Never give up your faith in the sweet old stones, even after you come to see that they are only the pleasant shadow of a lovely truth." "You will like to see this place, I think, and may learn something here perhaps"
Effie retired at once, but could not resist one look in at the window of a fine mansion, where the family were at dinner, the children behaved so well at table, and never grumbled a bit when their mamma said they could not have any more fruit. "Now, show me something else," she said, as they came again to the low door that led out of Doll-land. "You have seen how we prepare for Christmas; let me show you where we love best to send our good and happy gifts," answered the spirit, giving her his hand again. "Don't they have any in this place?" asked Effie, shivering, as she held fast the spirit's hand, following where he led her. "We come to bring it. Let me show you our best workers." And the spirit pointed to some sweet-faced men and women who came stealing into the poor houses, working such beautiful miracles that Effie could only stand and watch. "You have been dreaming at a great rate,—talking in your sleep, laughing, and clapping your hands as if you were cheering some one. Tell me what was so splendid," said mamma, smoothing the tumbled hair and lifting up the sleepy head. Then, while she was being dressed, Effie told her dream, and Nursey thought it very wonderful; but mamma smiled to see how curiously things the child had thought, read, heard, and seen through the day were mixed up in her sleep. "I've got it! I've got it!—the new idea. A splendid one, if I can only carry it out!" And mamma waltzed the little girl round till her curls flew wildly in the air, while Nursey laughed as if she would die. "Tell me! tell me!" shrieked Effie. "No, no; it is a surprise,—a grand surprise for Christmas day!" sung mamma, evidently charmed with her happy thought. "Now, come to breakfast; for we must work like bees if we want to play spirits tomorrow. You and Nursey will go out shopping, and get heaps of things, while I arrange matters behind the scenes." The next day was a very strange one; for when she woke there was no stocking to examine, no pile of gifts under her napkin, no one said "Merry Christmas!" to her, and the dinner was just as usual to her. Mamma vanished again, and Nursey kept wiping her eyes and saying: "The dear things! It's the prettiest idea I ever heard of. No one but your blessed ma could have done it." "Do stop, Nursey, or I shall go crazy because I don't know the secret!" cried Effie, more than once; and she kept her eye on the clock, for at seven in the evening the surprise was to come off. The longed-for hour arrived at last, and the child was too excited to ask questions when Nurse put on her cloak and hood, led her to the carriage, and they drove away, leaving their house the one dark and silent one in the row. "I feel like the girls in the fairy tales who are led off to strange places and see fine things," said Effie, in a whisper, as they jingled through the gay streets. After the handkerchief was tied about her eyes, Nurse led Effie up some steps, and placed her on a high platform, where something like leaves touched her head, and the soft snap of lamps seemed to fill the air. Music began as soon as Nurse clapped her hands, the voices outside sounded nearer, and the tramp was evidently coming up the stairs. Christmas for them that needed it!" Then each was led to her own tree by the good ladies who had helped mamma with all their hearts; and the happy hubbub that arose would have satisfied even Santa Claus himself,—shrieks of joy, dances of delight, laughter and tears (for some tender little things could not bear so much pleasure at once, and sobbed with mouths full of candy and hands full of toys). How they ran to show one another the new treasures! how they peeped and tasted, pulled and pinched, until the air was full of queer noises, the floor covered with papers, and the little trees left bare of all but candles! "I wish I dared to go and kiss her for this splendid party," said a lame child, leaning on her crutch, as she stood near the steps, wondering how it seemed to sit in a mother's lap, as Effie was doing, while she watched the happy scene before her. Effie heard her, and remembering Tiny Tim, ran down and put her arms about the pale child, kissing the wistful face, as she said sweetly, "You may; but mamma deserves the thanks. She did it all; I only dreamed about it." Older daughter Kate "thinks it's a very good story and it's wonderful! Thanks for posting it!" I'm glad Kate liked it. I find it interesting to see how childrens books and stories have changed during the years.